…Yeah, I know. Kind of scraping the bottom of the barrel on this one. Oh well. As I mentioned yesterday, I’m currently working my way through Overlord. 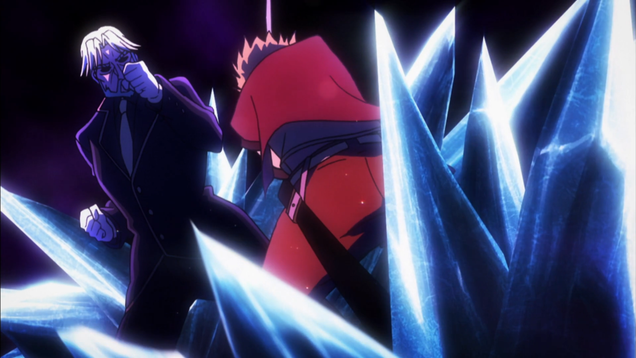 There are plenty of aspects of the show that are praiseworthy (as well as plenty of aspects that are less so), but a minor detail I noticed was how amazing the ice magic looks and sounds. The ice appears to grow into a massive, crystalline wall, and the ethereal sound effects make the whole affair incredibly satisfying. Overlord uses these effects several times, to great, er, effect. It’s a seemingly insignificant mote of quality that heightens the overall experience. Overlord isn’t the only show where I’ve noticed this, though my other example is much more obvious. Todoroki from My Hero Academia has probably the coolest power set out of anyone in the show, and his abilities are given the quality of animation to match their majesty. Every use of his ice powers sends a chill down my spine, to the point that I’m almost disappointed when he decides to use his fire abilities instead (though those scenes are exquisitely animated as well). Now, I’m a relatively new anime fan, so I’m sure this revelation has already been well established. So my question to the veterans reading this is: what are some other “cool” ice users in anime? Are their attacks presented as well as the ones in these two shows?